A Lush Outdoor Space. 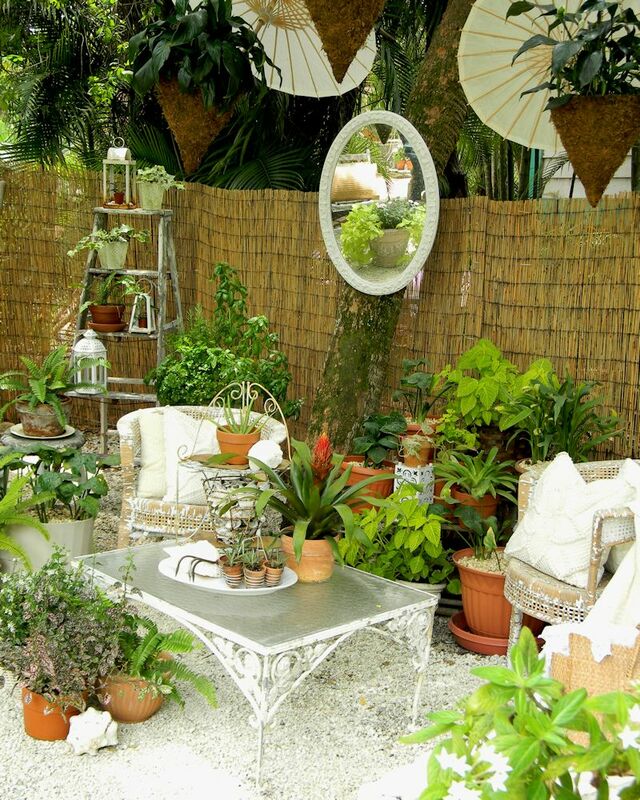 Melinda Graham’s outdoor garden room. This and all photos courtesy of and copyright by Surroundings by Melinda. 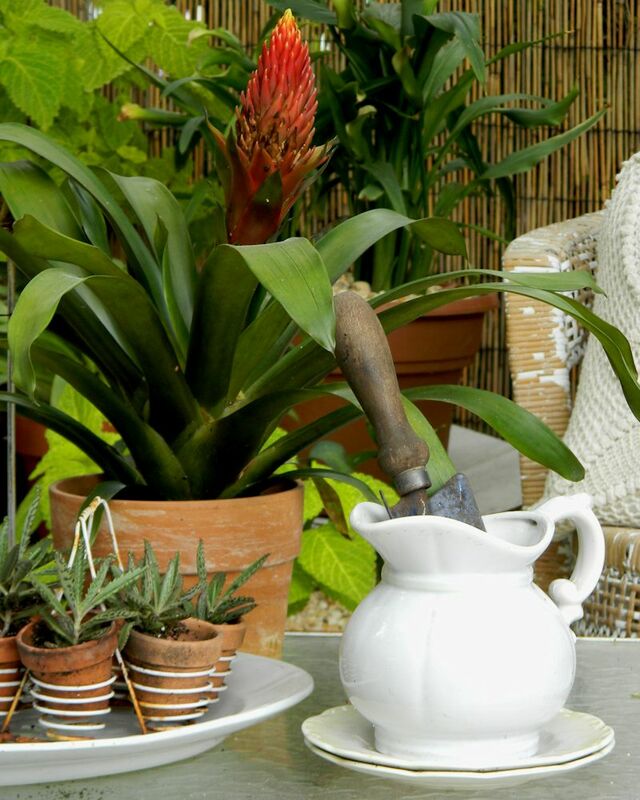 For those of you in mild climates (and the rest who are slogging through the cold-weather months), Melinda Graham, GV’s authority on decorating and outdoor living, offers a little practical advice and visual inspiration for creating outdoor rooms, even if that means waiting for the spring. I love the expression “made in the shade”. Not really ever sure what it actually meant, I did what everybody does and Googled it. According to the Urban Dictionary, it is an expression from the 1950s which means to be in an excellent or ideal situation or place. I currently live on a little island in the Gulf of Mexico and for a transplanted Northern gardener, the southwest Florida sun was a rude awakening. I am essentially starting over as a novice gardener and don’t have a clue about what I am doing. I do, however, know one thing for a fact: shade is a godsend! The intense sunlight is so hard on almost every plant I love, but there is one small corner of my garden with a lovely canopy that provides the most incredibly dappled light. It is beautiful! I have taken advantage of this small shaded area to create a garden room. The interior designer in me sees everything as yet another space to decorate and this shady corner is no exception. So my creative side immediately took over. The challenge was to define a space for a room with no walls. The “ceiling” was provided by the tree branches overhead but I needed walls and I set off in search of an inexpensive solution. The walls didn’t need to be structural, just a visual barrier. I decided on bamboo from a garden center. It is lightweight, inexpensive and easy to work with. Voila…walls! Once the boundaries of the room were established I was determined to decorate the space. 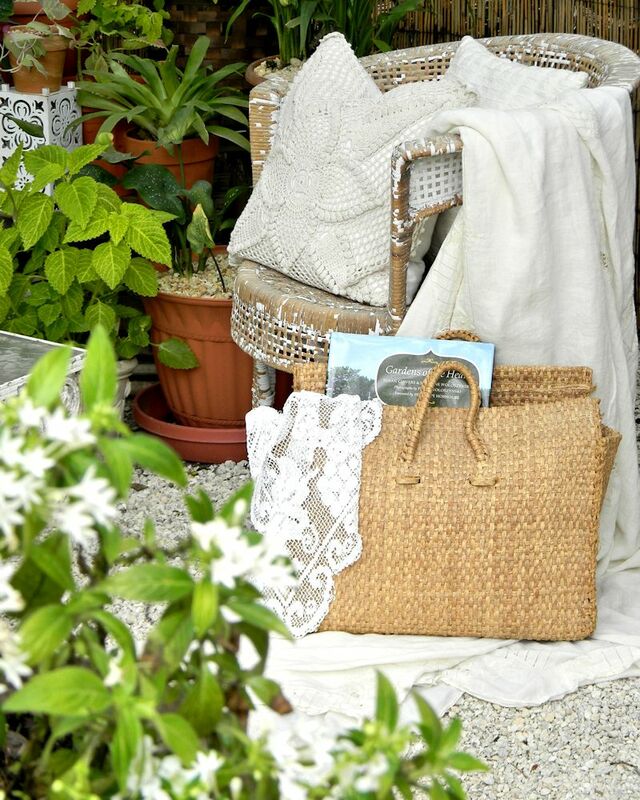 I used primarily vintage wicker and wrought iron. All were thrift shop finds. The other furnishings were garden-friendly old ladders and tool caddies. I am not one to skimp on accessories since exterior rooms need to be dressed just like interior rooms. 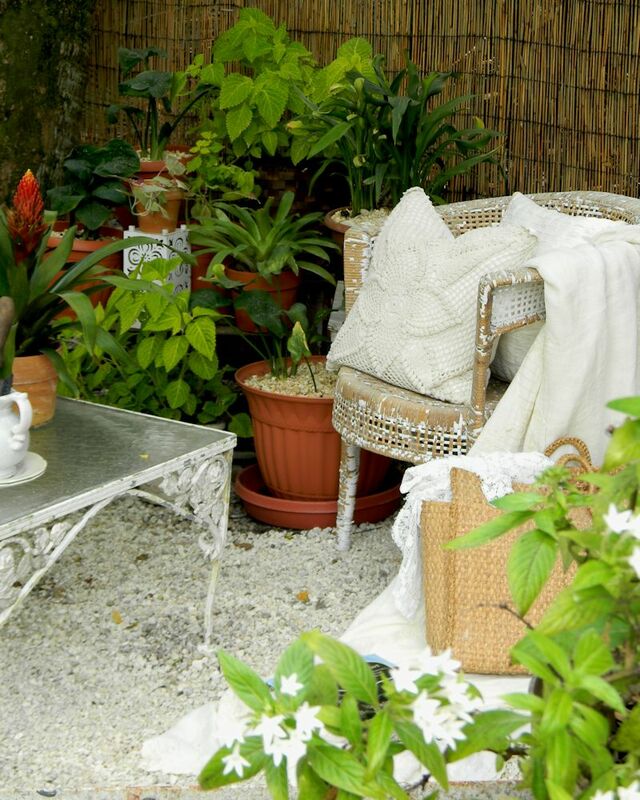 I filled the chairs with pillows covered with old bits of lace and crochet, placed parasols in the hanging moss planters and accessorized with plants and retired garden tools. I tend to use mirrors in my garden rooms as well. They add dimension and perpetuate the myth of walls in an extraordinary way! Each garden in every zone is as different as gardener our individual. I know this would not be a practical garden space in many areas, but it is my hope that you will be inspired. 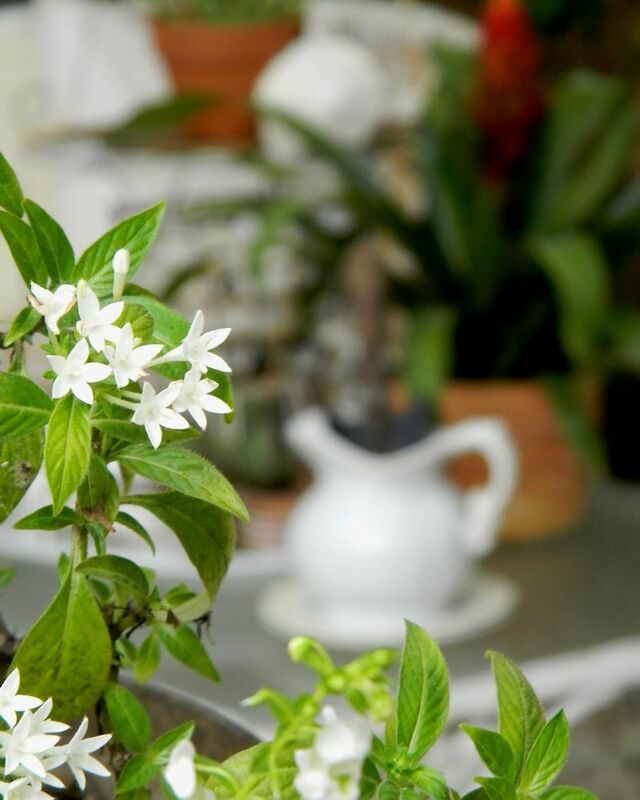 So, whether you live in a warm climate or are buried under a foot of snow and dreaming of days in your garden, steal a few minutes out of your busy schedule to daydream. 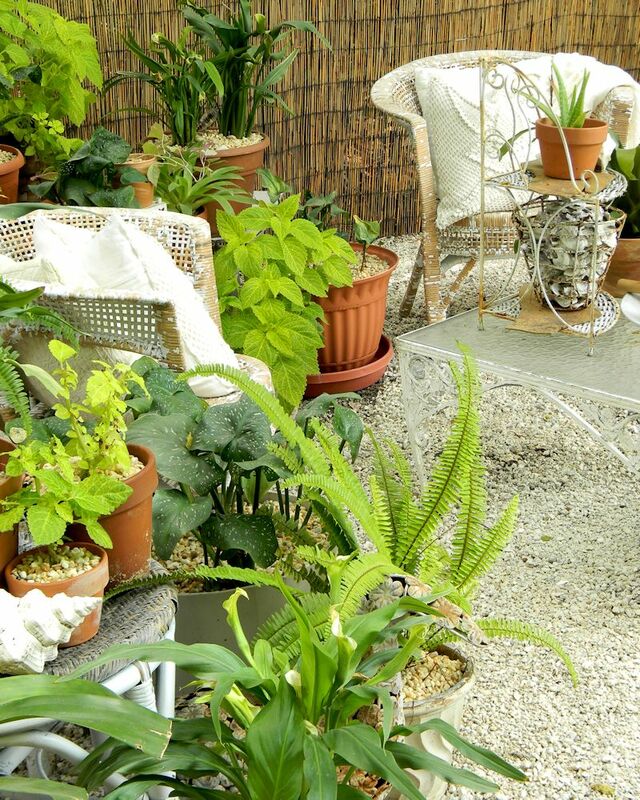 Take a look around your garden using your creative eye and visualize a potential room. When the time comes, decorate your space in your own personal style and flare. Use inexpensive thrift shop finds in unexpected ways and just have fun. 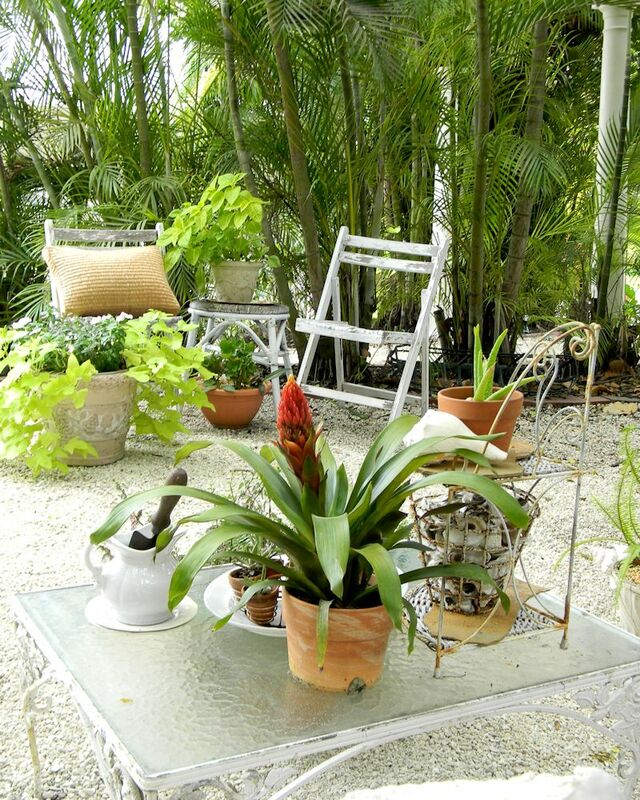 I love to experiment with both my indoor and outdoor spaces. And I truly love my garden room. The way I see it, it’s made in the shade! 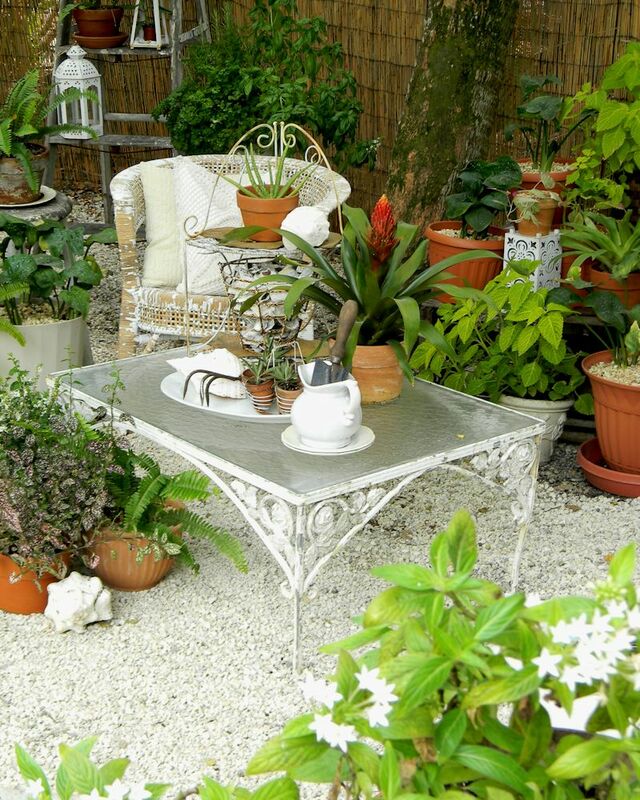 For unique vintage garden-inspired decor and housewares, visit Melinda’s Web site, SurroundingsbyMelinda.com. Outside In is a column that explores the blurring of lines between indoor and outdoor spaces—gardens, yards, porches, patios, decks, verandas, balconies, rooftops and terraces—providing inspiration for plantings, furniture, décor and design. This entry was posted in Garden Decor, Outdoor Decor, Outdoor Furniture, Uncategorized and tagged garden decor, garden decorating, interior designer, Melinda Graham, outdoor decorating, outdoor rooms, outdoor spaces, patio decor. Bookmark the permalink. This is lovely! I live in a humid part of the South, too. How do you keep birds from breaking the mirror, humidity from spoiling the old lace, winds from howling the ladder to the ground, etc.? Or do you put it all away when you’re not entertaining? Oh, sorry, also meant to ask a design question: Why did you use the fence to exclude the bases of the shade plants, as opposed to including them? Just trying to learn, here. Thanks! The fence is actually a barrier from the neighbor’s property. In this case it is more for privacy and to help create the appearance of a room. Well…I have never had a problem with the birds and the mirrors. I mount them in “no-fly zones” usually in more covered areas of the garden where birds may be hopping about the ground but not I flying past. The linens I use are old damaged tablecloths or pillowcases so when weather gets the best of them I toss them and start over. If the ladders are in the open I will anchor them to a tree or fence. This corner it is very protected from wind. Great questions! Thanks for asking!! !